Every place -- or most places -- that you rent have less than inspiring window treatments: offwhite blinds. Today as I sat at my desk staring out the front bay windows, dreaming (no wishing) I was somewhere else, I thought about how nice curtains with type would look. 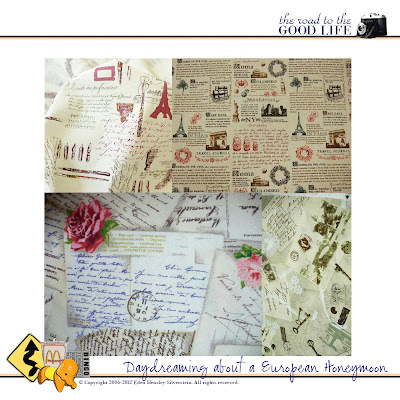 The Finds (top left clockwise): Letters from Paris, $7.80 per 1/2 yd (more yardage available); Travelogue, $8 per 1/2 yd (more yardage available); and Love Letters from France, $8.50 for 1/2 yd; French Postcards, $12 per yd. None of these options would work in our living room (all of our accent pillows are striped), but for a teenaged girl studying French or dreaming of a year abroad they're ideal. Credits: All images taken by their respective Etsy sellers: Fabric Made, Grandma's Fabrics, Rue 51 Paris, and Trinkets in the Attic. Collage created by Eden Hensley Silverstein for The Road to the Good Life.